The team had a successful launch day, reaching an altitude of 4,072 feet, which was only 128 feet off our declared altitude. We also were able to successfully deploy our UAV and deliver the beacon to the Future Excursion Area! Thank you to everyone who supported us during our crowdfunding campaign, Dr. Jerry Dahlberg, University of North Carolina at Charlotte, The William States Lee College of Engineering, NC Space Grant, Solidworks, Mechanix Wear, friends, and family for everything this year! 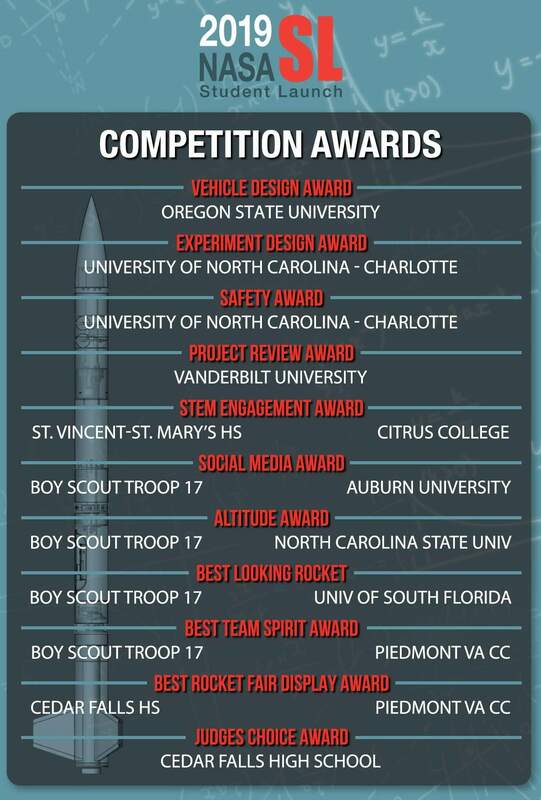 We brought home the First Place Safety Award, First Place Experiment Design (Payload) Award, Second Place Project Review (Documentation) Award, Third Place STEM Engagement Award, and a Third Place tie for Best Looking Rocket! We are a team of engineering students at UNC Charlotte who are entering this year’s NASA Student Launch Competition. This is a rigorous and fiercely competitive challenge to design, build, and fly a high powered rocket to complete a mission designed by NASA. 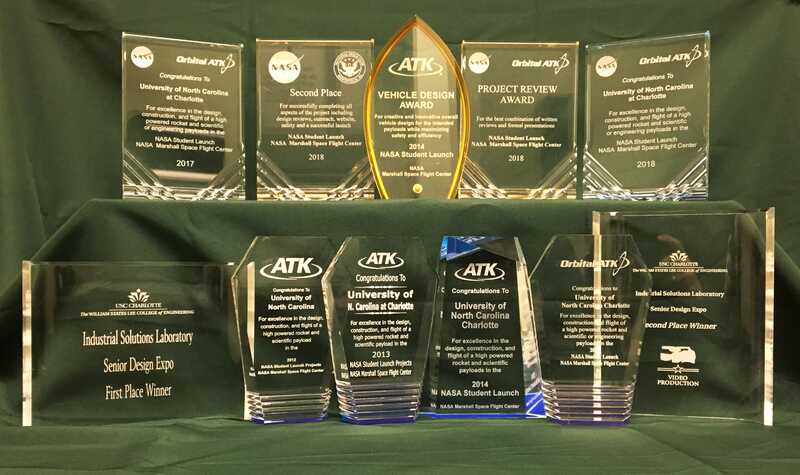 In total, seven teams from UNC Charlotte have competed in this prestigious challenge, beating teams from MIT, NC State, the Naval Academy and other veteran aerospace schools. The last three teams to compete from UNC Charlotte placed in the top five overall. We intend to carry UNC Charlotte’s venerable reputation and tradition of excellence into this year’s competition. We are currently designing a rocket that will carry a Unmanned Aerial Vehicle (UAV) to an altitude of 4000-5500 feet and return to the earth unharmed. Upon landing, the UAV will be deployed and will autonomously fly to a NASA-specified location to deliver a simulated navigational beacon. 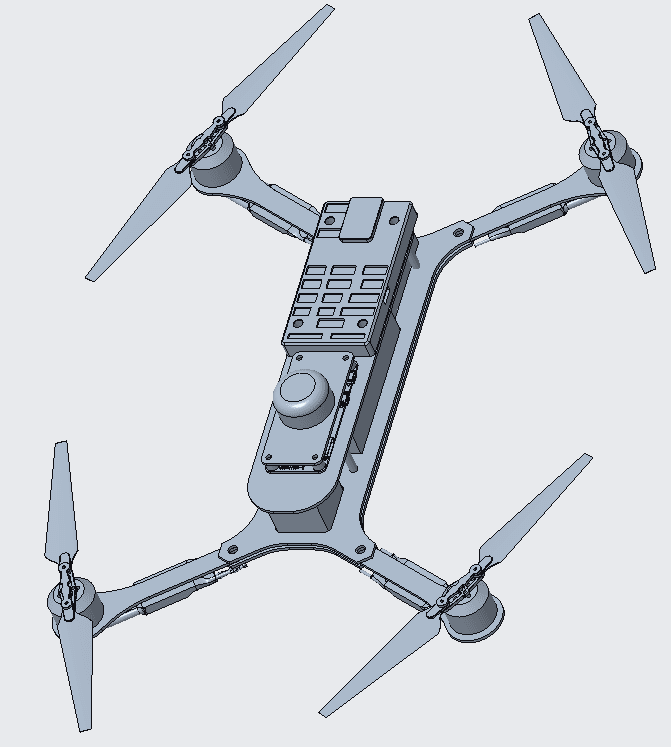 To meet these requirements, we will be designing a deployment mechanism that will allow the UAV to be safely started and flown without a rocket airframe interference. In order to be successful, we need your help! The development of a system that will be competitive is costly and we will be up against teams with well-funded aerospace programs. Between the development budget of the vehicle and payload, as well as our travel expenses to attend the competition in Huntsville, AL, our total anticipated budget is nearly $21,000! To carry our passion and ambitions into the community, our team will also be conducting numerous outreach events at local schools to help nurture K-12 students' curiosities in the STEM field. Our goal is to reach more than 600 students over the course of the competition. Your generous donation will not only help secure UNC Charlotte’s success in this competition, it will also give us the ability to inspire future generations through our STEM outreach. 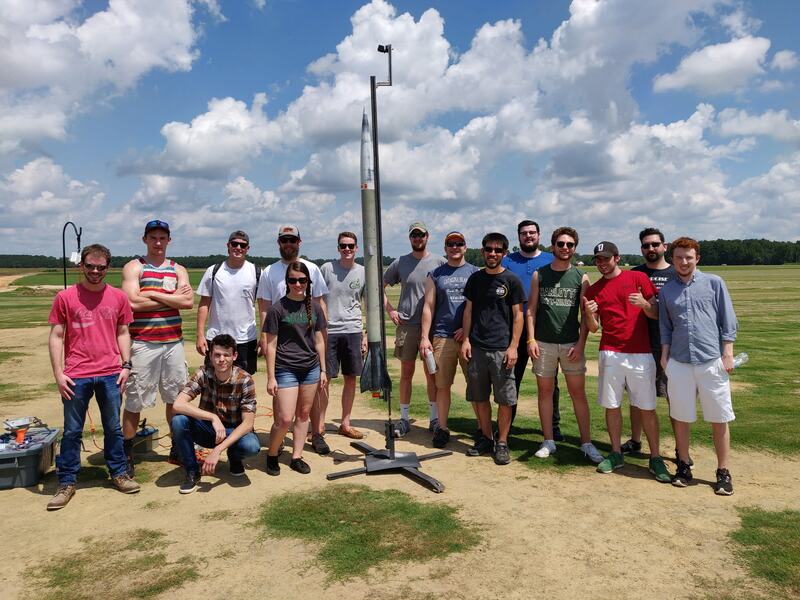 Donate today to invest in the future of high powered rocketry at UNC Charlotte and in future engineers! Your donation will help feed a team member for a day in Huntsville, AL when we go to the competition. Your donation will cover the purchase of one motor for vehicle test flights. Your donation will cover a full day of launch activities, including food, gas, and equipment. Your donation will cover the cost of the sub-scale airframe. Your donation will cover the cost of the full-scale airframe.